Please enjoy this article from the 1/31/2017 edition of The Farmers and Consumers Market Bulletin Subscribe Today to enjoy more articles like this and many more regular features. Q: How did you get your start farming? A: I've grown up on our farm, so my start came really early. I have always had chores on the farm and helped out however I could growing up, but I never planned on farming for a career; I wanted to write and/or publish books. I graduated from Mercer University in 2012 with an English degree and no job experience, so finding that dream job was a challenge. I tried teaching for a year and didn't like it, so I moved back home and continued the job search. During that time, I started working with my dad every day and soon realized I really liked what I was doing. Four years later, I couldn't imagine living or working anywhere else. Q: What does your farming operation primarily consist of? A: We have a typical South Georgia row crop operation - cotton, corn, and peanuts. We also raise about 275 commercial beef cows. Q: What advantages and disadvantages do you think there are to being a younger farmer? How has being a woman played into these? A: An advantage to being a young farmer and one who has no formal Ag education is that I don't pretend to know everything. So, I question everything. How do we do this? Why do we do it that way and not another way? Can we do it better? I don't know if my gender has really hurt or helped me, but it's always conversation starter. Q: Who has been your biggest role model in farming, and what is the best piece of advice they have given you? A: My Dad is my biggest role model, and he's given me lots of advice over the years. The one that sticks out the most is "Stay focused," which usually means stay focused so you don't tear something up, but it also means stay focused on your end goal and find the best way to get there. Q: What are your hobbies and interests outside of farming, and how are you able to maintain your work schedule while also participating in those? A: I am a perpetual hobbyist and am always finding some new skill that I want to learn. I took up beekeeping last year, and I've greatly loved the ups and downs of that endeavor. Most recently, I've been learning to quilt. Our "downtime" is December through February, when we're not growing any crops. We still have plenty of work to do with the cows and getting the farm ready for planting season, but that's when I have the most time to devote to hobbies. Throughout the rest of the year, I just fit them in when I can. 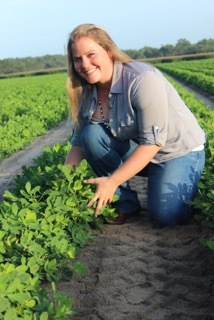 Q: What do you think is the most important thing that young female (or male) farmers need to know? A: Find a network or support group of other young farmers, whether that means joining an organization like Farm Bureau, Georgia Young Farmers, or just creating one of your own. Farms are, of course, rural and can be isolating. It's important for me to feel connected to other people who share the same experiences.